Editor's note: American Morning's Alina Cho will be reporting live from Pyongyang, North Korea on CNN Sunday night, Monday morning at 6:00AM ET on "American Morning" and CNN International. 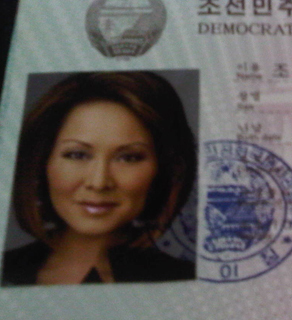 A glimpse of part of Alina Cho's North Korean visa. She will report live from Pyongyang for CNN on Sunday and Monday. It is Saturday morning Beijing time, and we have just left the North Korean embassy with visas in hand. This is our ticket to North Korea, and it was not easy to get! Now, we head to the airport where we will board a plane to the capital, Pyongyang. This is my second trip to North Korea and I couldn't be more excited. Remember, this is one of the most isolated societies in the world, part of the so-called "axis of evil." A communist nation with one of the largest armies in the world. A place where the average North Korean has no access to the internet, no cell phone and where all TV and radio is tuned in – always – to government channels. It is simply surreal. We are going at an important time in North Korea's history. The longtime dictator, Kim Jong Il, has effectively named his third son, Kim Jong Un, the heir apparent. But will the communist dynasty continue under the son's rule? The media has been invited to cover what's being billed as the largest military parade in this country's history. Will we get a glimpse of Kim Jong IL and his son? One can only hope. I will be reporting LIVE from inside North Korea starting Sunday night and Monday morning on "American Morning" and CNN International. Stay tuned, much more to come.